Tesco and Esso have brought back their double points with Synergy Supreme + premium fuels. Until 31st August 2018 filling up your tank with Esso Synergy Supreme+ premium fuels, will give you double the amount of Clubcard points. Esso Synergy Supreme+ Diesel and Synergy Supreme+ Unleaded Petrol contain twice the detergent additive of regular Esso Synergy Diesel and Synergy Unleaded Petrol, which apparently helps giving a deeper clean of your fuel injectors and therefore promises better engine performance – not that I have any idea how and if it works. 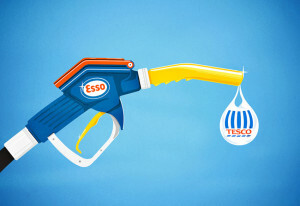 The relationship between Tesco and Esso is complex. Tesco is running most of Esso’s convenience stores and as well as earning Clubcard points when buying things in the store, you also receive Clubcard points on fuel. You can even earn Clubcard points when buying fuel at Esso garages that do NOT have a Tesco store attached. There isn’t much about the Esso / Clubcard relationship on the Tesco website as you can see here and you will need to visit the Esso website in order to find out more. So how many CC points if you fill up with Synergy Supreme Plus at a Tesco branded filing station? – i.e no Esso branding? It is really only the high-end cars (Ferrari, Rolls-Royce, Highest end Mercs etc.) that need the better quality fuel, even though the fuel companies advertising makes it out otherwise, but it’s a myth. For the great majority of cars the ordinary diesel/petrol is more than adequate. So TBH you are better saving the 10p+ extra per litre and foregoing the additional points.